Any Israeli aggression against Iran, whether in the form of military action or cyber-attacks, would be “an enormous mistake,” US Secretary of State John Kerry said in an interview. Following the nuclear deal with Iran that was reached last week, Kerry was asked in a Friday interview on the NBC "Today" show, whether that development could incite Israeli to attempt attacking Tehran. 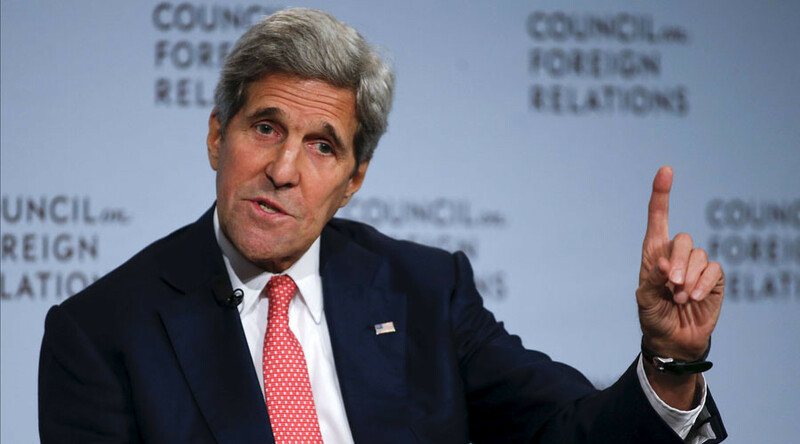 "That'd be an enormous mistake, a huge mistake with grave consequences for Israel and for the region, and I don't think it's necessary," Kerry answered. US Secretary of State shared his views on the deal itself, saying that the US had no better option. "The alternative is to have no inspectors, not know what Iran is doing, go back to where they are today with the ability to make the bomb," Kerry said. "And then you're going to hear everybody say, 'Uh oh, we've got to go bomb them now." “People forget, when President Obama came into office and when I became Secretary of State, Iran already had in the tens of thousands of centrifuges. They already had fissile material, enough for 10 to 12 bombs,” he added. “What we've done is roll that program back and provide a capacity to have inspectors going forward so we will know what Iran is doing." Kerry also commented on the 24 day-long time period given to Iran before inspectors’ checks of the suspicious sites. "This is nuclear material. It radiates...This is not something that you can flush down the toilet. It's not possible," he said. However, Kerry pointed out that the agreement over nuclear weapons was not built upon mutual trust. "There is no trust — no, no, no. This is not based on trust," he said. "That's what's important to understand. Everything in this agreement is verifiable. It is a process by which we will know what they're doing." On Friday, Kerry also discussed the Iran nuclear deal at the Council on Foreign Relations, a US think tank organization. “I am absolutely convinced, totally, that the threat of other countries is greater if you don’t have the deal than if you do. And the reason for that is very simple: if we don’t have this deal and Iran goes back to enriching which they’ve said they’re going to do and there are no inspections and we don’t know what is happening, the pressure that existed … will melt,” Kerry said. The deadline for the US Congress to vote on the deal is September 17. The agreement was reached in Vienna between Iran and six world powers last Tuesday. It secures the lifting of economic sanctions in exchange for Iran agreeing to a 15-year moratorium on enriching uranium beyond 3.67 percent and to let International Atomic Energy Agency (IAEA) inspectors to the nuclear sites. The announcement of the deal details has recently triggered furious responses of senior Israeli diplomats, who were concerned with the credibility of the inspections, Arutz Sheva reported. Israel is believed to have masterminded several cyber strikes aimed at stopping the Iranian nuclear program, such as the 2010 “Stuxnet” virus that sabotaged Iranian facilities. In May 2012, Israeli Defense Minister Moshe Ya'alon alluded to the possibility of Israel’s contribution to the "Flame" malware, which is considered to be the successor to Stuxnet.